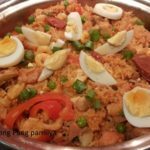 Arroz Valenciana pinoy style and it is similar to Paella, a dish adopted from Spanish dish, it is a combination of jasmine rice and glutinous rice and cook with pork , chicken, sea foods, ham and chorizo. Heat olive oil in a deep heavy skillet or paellera. Brown chicken and pork over medium heat. Sauté garlic and onions , add ham and chorizo or sausage. Cook for 2 minutes. Add rice, browned chicken, pork and fish sauce, sauté for 4-5 minutes. Add tomato sauce and boiling chicken broth. Mix well and let to a boil. When rice is haft way done drop the red bell pepper , Lower down the heat and cook covered until all liquid is absorbed by the rice. Turn rice over and add shrimps and peas. Cover and cook for another 5 minutes. Adjust the taste and season with salt. Garnish with hard cooked eggs, spring onion and sliced of lemon. Hey Buddy!, I found this information for you: "Arroz Valenciana". 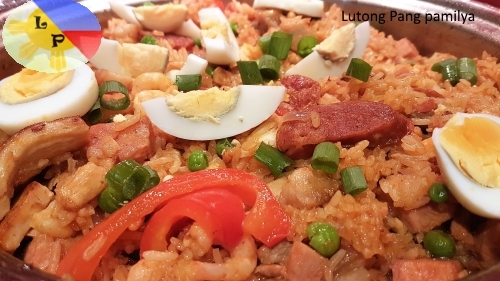 Here is the website link: http://lutongpangpamilya.com/arroz-valenciana/. Thank you.